Manufacturing firms in Suffolk and Norfolk are innovative and agile, and East Anglia’s urban areas are growing fast. You may not be aware that Ipswich and Norwich have two of the fastest-growing urban economies in the UK but, according to the latest UK Powerhouse report from Irwin Mitchell, they do. Along with neighbouring Cambridge, they were among only seven centres that saw their gross value added (GVA) increase by at least 2 percent in Q2 2017. That reflects the continued strength of the East’s economy. Between them, Suffolk and Norfolk generate some £35.5bn of GVA a year for the UK, up 9.6 percent in real terms since 2009. As the New Anglia Local Enterprise Partnership (NALEP) points out in its economic strategy, that is faster than the 8.6 percent national average (ex-London) and many better-known ‘powerhouse’ areas. A diverse community of innovative manufacturing and engineering businesses is helping drive this growth. Food and Drink, the largest sector, employs 20 percent of the manufacturing workforce; it includes processors and producers like Muntons (malts and other ingredients), British Sugar and Bernard Matthews. There are also numerous specialist brewers and distillers, such as Adnams, which has a range of award-winning beers and spirits, and a reputation for eco-friendly production methods. Eastern England’s strong Food and Drink sector has fuelled the growth of a specialist engineering and manufacturing supply chain. There are some 125 such firms in Suffolk and Norfolk. These include machine designers and makers such as Fabcon Food Systems, processing equipment; Thurne-Middleby, precision meat slicers; and Sinclair Systems, food-labelling equipment. Other manufacturers supplying the food industry in the region include Philips AVENT in Suffolk, which makes baby bottles and health equipment. These companies form part of the (non-food) Advanced Manufacturing and Engineering sector, one of the region’s largest employers, comprising more than 5,920 businesses and employing around 84,500 people. Many specialise in serving automotive, energy, marine, aviation and pharmaceutical clients, locally and globally. Overall, they generate £5.1bn a year in GVA (around £60,000 per head); around 14 percent of the region’s total GVA from 11 percent of the employees. It’s no wonder NALEP’s new economic strategy identifies this as one of the region’s nine key sectors (along with high-value, high growth businesses such as life sciences, construction, logistics, technology and digital creativity). Among this elite group of manufacturers are familiar names like KLM Engineering UK, which is one of the sponsors of the new International Aviation Academy in Norwich (IAAN). Another local firm with a strong IAAN relationship is Mirus Aircraft Seating. They use automotive technologies (including carbon fibre and forged aluminium) to create strong, lightweight seats for aerospace clients worldwide. 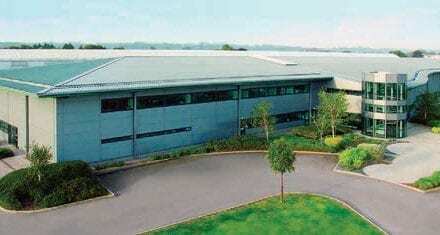 Group Lotus PLC’s Lightweight Laboratory is located at Hethel, just south of Norwich. Here they evaluate the contribution every component makes to a car’s performance, from the carbon fibre panels to the aluminium chassis. Their hand-made, high-speed sports cars have inspired a generation of race enthusiasts and engineers. Building on that tradition of excellence in the region is the Hethel Engineering Centre (HEC), a specialist innovation cluster of around 50 advanced design and manufacturing fi rms. Tenants include companies like Ansible Motion, which develops motorsport and road car driving simulators (see main photo). Also on site is Corum Technology, which specialises in vehicle dynamics and chassis development. A short drive away, Polar Manufacturing creates bespoke carbon fi bre and composite designs in their purpose-built facility, for prestigious automotive clients including Lotus, Bentley, Aston Martin and Cobham. Further down the now fully-dualled A11 towards Cambridge, past the famous Snetterton Circuit, Thetford’s industrial zone hosts Multimatic’s European Technical Centre, which specialises in vehicle design, engineering and development for the global automotive and aerospace industries. Nearby Warren Services operates advanced design, welding, fabrication and precision milling facilities. Their clients range from Rolls- Royce to international theatres and even pop bands – they once built a 20-metre robot for Take That. February 2017: the Government announced £69m in new funding for New Anglia LEP from its Local Growth Fund, taking the LEP’s total award to £290m since 2014. New Anglia LEP has allocated more than £100m to boost skills, drive innovation, provide targeted business support, and improve transport and infrastructure. More than £20m in grant funding awarded to firms across the East since 2011. This has helped unlock a further £96m of private investment. Outline planning permission granted for a new 114-acre Suffolk business park on the edge of Bury St Edmunds, including Enterprise Zone status for 34-acres. Treatt – the flavourings, fragrances and ingredients manufacturer – is building a new 200,000-sqft global HQ on 10-acres of the Suffolk business park. Fabcon Food Systems secured a £1.5m deal to supply production line systems for a new fried crisp factory in Kuwait. Norfolk and Suffolk has over 53 businesses in the Electronics, Sensors and Photonics sector, including semiconductor and electronic design, sensor systems, and power electronics. Richard Bridgman, founder of Warren Services in 1990, recently stepped down as chair in favour of his son Will and now focuses on his roles as an EEF regional advisory board member and membership of the NALEP Skills Board. It works closely with West Suff olk College, Bury St Edmunds, which has around 10,000 further education students pursuing vocational and academic qualifi cations. It recently secured £7m from NALEP’s Growth Deal to develop a new Engineering and Innovation Centre, specialising in STEM subjects. The 5.5-acre site is currently home to Vinten, a major manufacturer of lightweight, professional camera equipment, which is moving within the area. The New Anglia Advanced Manufacturing and Engineering group, NAAME, based at Hethel, is a private sector-led body that provides a range of start-up, scale-up and innovation programmes. It works with NALEP to support the development of Science and Technology Parks across the region’s multi-site Enterprise Zone and to encourage inward investment. NAAME nurtures cross sector collaboration and links with local universities and other industry bodies. These include OrbisEnergy, the off shore renewables hub in Lowestoft, and the East of England Energy Group (EEEGR), which represents around 300 supply chain companies. NAAME is also working with Low Carbon technology companies, particularly those developing advanced lightweight materials such as bio composites. What the East lacks in heavy industry, it makes up for with nimble manufacturers using cutting edge technology. Synergy between sectors, and a willingness to share ideas and expertise, makes this a dynamic region to do business. If you are interested in manufacturing opportunities in the East, please contact Julian Munson, who is head of Enterprise Zones and Innovation at NALEP. Huw Sayer is an experienced business writer and editor based in London. He is also a communications consultant and social media trainer.